The two pipes with the blue handles are water pipes that are supposed to go to the washing machine I'm having delivered tomorrow. I forgot to double check the connections and find that the lower one - which is actually the hot water despite the handle color - just had a screw cap in the pipe end, but the upper one has a soldered pipe cap that my soldering iron won't be hot enough to melt. I'm not totally sure how I'm going to get that off before tomorrow. Moreover, I'm realizing these threaded pipe ends are unlikely to connect smoothly with the hoses for the machine. 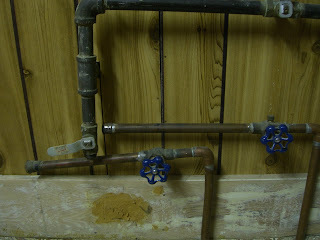 Hopefully a trip to the hardware store for some spigots will fix that. a blow torch, perhaps? Or maybe a small cannon? I'm not certain how a cannon would be applied here, but it's certainly on the list for future endeavors.